Replacing our existing heat pump thermostat was uneventful. I just carefully followed the instructions from Honeywell on how to install it. Our system was new enough to have a C-wire run but not connected to the existing thermostat. Honeywell's online tools and video helped me through this quite well. Hooked everything up as directed. The thermostat connected up to our WI-FI network easily. It began showing the outdoor temperature immediately. About 3 hours later, the unit is showing "Waiting for Update....", where it was displaying the outdoor temperature and humidity. I checked wifi connectivity to the unit and it was communicating with the internet just fine. In fact when I logged into mytotalconnectcomfort.com website the thermostat current readings showed along with the current area weather forecast. Checking out a few forum posts on the web there seems to be an automatic firmware update that breaks updates from Accuweather. Currently it's been more than 24 hours. If it continues, I'll probably give customer service at Honeywell (855-733-5465) a call. Still having issues so I contacted Honeywell technical support. Here is their response. Thank you for contacting Honeywell. “Waiting for Update” is a notification message that appears on the thermostat’s readout when the thermostat is trying to fetch the information pertaining to ‘Outdoor temperature and humidity’. RTH9580WF has the feature of showing you the ‘Outdoor temperature &and humidity’ on the screen of the thermostat. Login to your Total Connect Comfort account on your computer. Click on 'Control Center' then 'My Location'. You would see the 'Settings' option beside 'View your thermostat'. Please click on 'Settings'. Scroll down the page and reconfirm your Zip/Postal code. Press 'Menu' tab and then scroll down to select 'Wi-Fi Setup '. After disconnecting from the network take the thermostat off the wall for 1 min. After that put the thermostat back on the wall and connect to the Wi-Fi network again by going to Wi-Fi Setup. Please provide us with the MAC and CRC Id of the thermostat. Is the thermostat connected with the Wi-Fi? If yes, please provide the date since it was connected to the Wi-Fi (approx)? Please provide us with the email address with which you are registered with us? Please provide us with the Zip/Postal Code for the location of the thermostat? If the issue still persists, then feel free to contact us back either via email or our Technical Support helpline number: 1-855-733-5465. Their operational hours are 8.00 AM to 7:00 PM CST, Monday through Friday and 8:00 AM to 6:00 PM CST on Saturday and Sunday. Still had issues after doing all the above, so I called Honeywell technical support. They walked me through a reset of my wireless network. I reset the thermostat with their technical on the line. Still didn't work. Then, I changed to the wireless to another wireless network in my house. Moved it from my primary network (which runs through a smoothwall firewall) to my cable modems direct wireless network. Viola - it worked. Did the same with the second thermostat and it also worked. 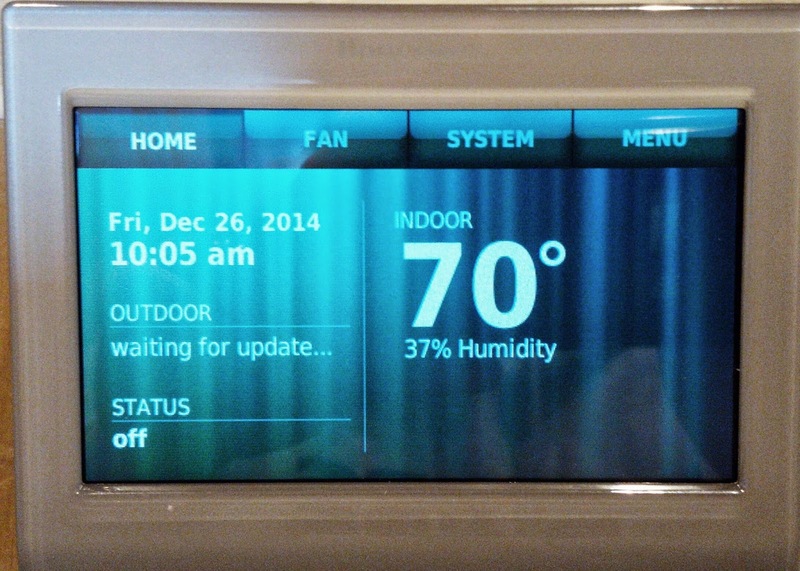 It been almost a week since the reset and both thermostats have been working great. Not sure why the thermostat doesn't like my primary wireless SSID, but I can live with moving it to the second. After having more time to troubleshoot. The issue is caused by a transparent SQUID proxy setting on my Smoothwall 3.0 firewall. When I turn off the transparent setting on the web proxy the thermostats communicate fine. When I turn it on they fail. After having even more time to troubleshoot. I upgraded my firewall to Smoothwall 3.1. This update also bumped the Squid proxy version to v3.5.7. I thought perhaps there would be a fix to the issue. The proxy would fail with the Smoothwall web proxy showing the error "error:invalid-request". Pulling the actual log entry it looked like this "TAG_NONE/400 2568 NONE error:invalid-request - HIER_NONE/- text/html"
I worked around the issue by installing Smoothwall mod Enhanced Web Proxy. Then I added in the IP addresses of my two thermostats to the "Bypass proxy SRC IP addresses list" in Enhanced Web Proxy. Now I can turn on the proxy for the rest of my network, but my thermostats can still display the current weather on them. I also noted that the thermostats request a weather update every 15 minutes. Here is my deep dive into how the Honeywell thermostat gets it weather information.